I really enjoy making sweet treats from scratch, but sometimes a few shortcuts aren’t bad either. This was definitely the case when I made brownies this weekend. 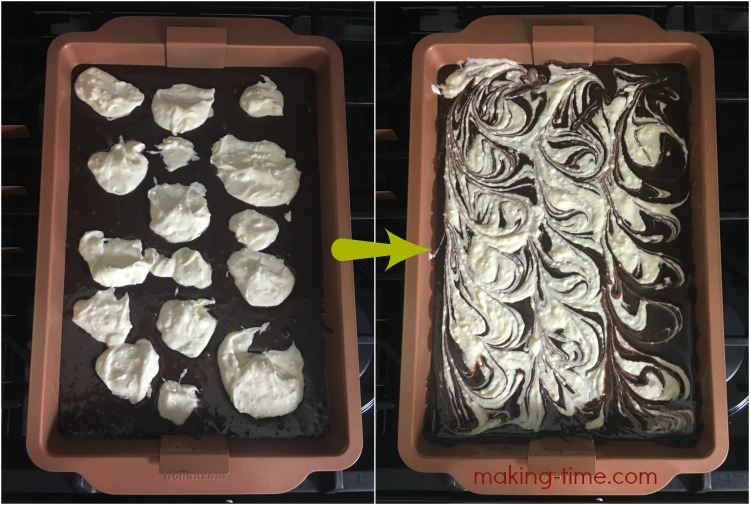 I’ve been so busy, but wanted to treat my family to something fun and tasty, so I pulled out all the shortcuts I could to make some Easy Cream Cheese Marble Brownies. The first shortcut? Using a box brownie mix. I have no shame in admitting that I actually save money and time by sometimes using a box brownie mix. But the taste is still there so my family gets to enjoy the chocolatey treat all the same. Whether you’re loyal to baking from scratch, or use a box brownie mix, there is no judgment here. The second shortcut? My new Red Copper Brownie Bonanza from BulbHead. Ya’ll! This is a total game changer when it comes to baking brownies. You will never again have to hear your kids complaining about the other one got a bigger piece of brownie because with the Brownie Bonanza, each and every brownie is the same size. And not only that, it’s so simple to get these perfect brownies at no extra effort from you. Just how does Brownie Bonanza give you the perfect brownies each and every time? Let me show you. 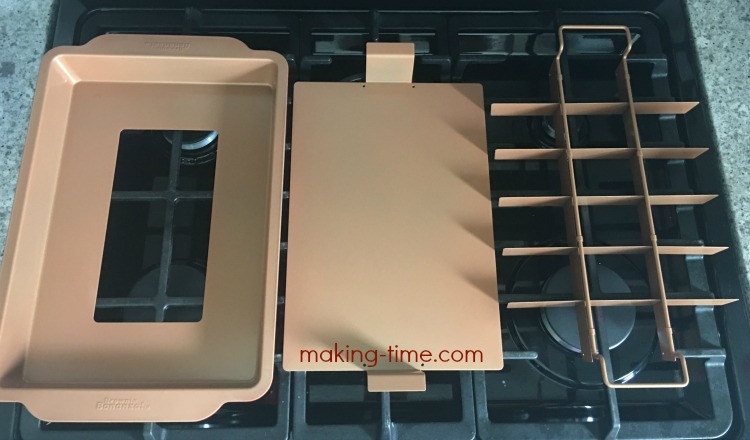 Brownie Bonanza comes in 4 pieces – pan, tray, grid, and cooling stand (not shown). 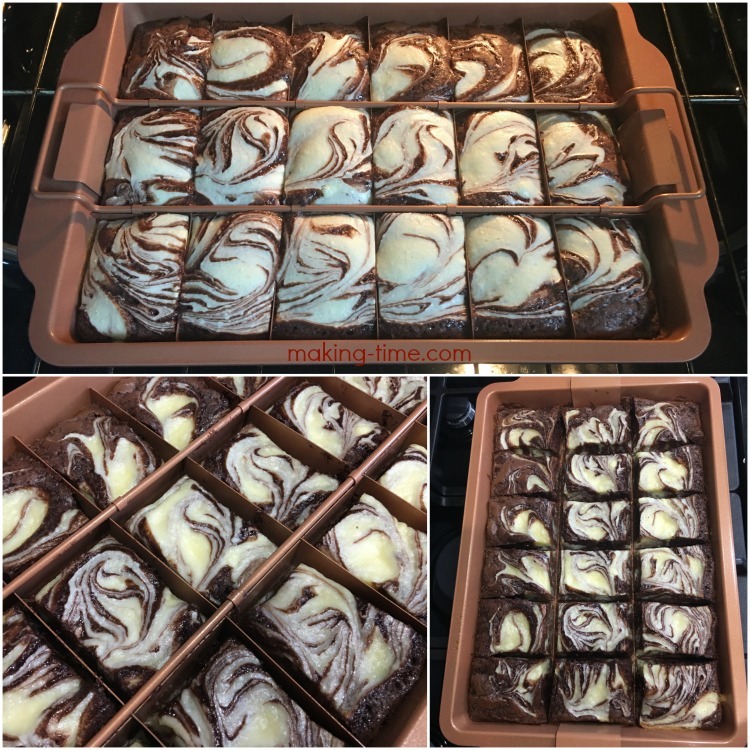 Simply place the tray into the pan, and for my Easy Cream Cheese Marble Brownies, mix up the box brownie mix per the box instructions and pour it over the tray. 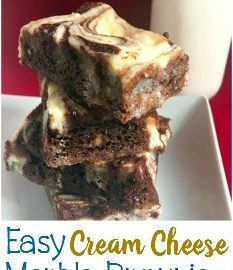 Then mix up the cream cheese topping (full recipe below), dollop spoonfuls atop the brownie mix, and swirl it around. Swirl it up/down, left/right, around in swirls, however you want to. Now, this is where the magic happens. Insert the grid for those perfect sized brownies and bake according to the box instructions. When the brownies are done baking, remove them from the oven and let them cool. Only remove the grid once the brownies have cooled down. Aside from touching to know they’re cool, you’ll also notice the outsides of the brownies separate from the grid. The ceramic nonstick, anti-scratch surface is one of the fun features of the Brownie Bonanza. 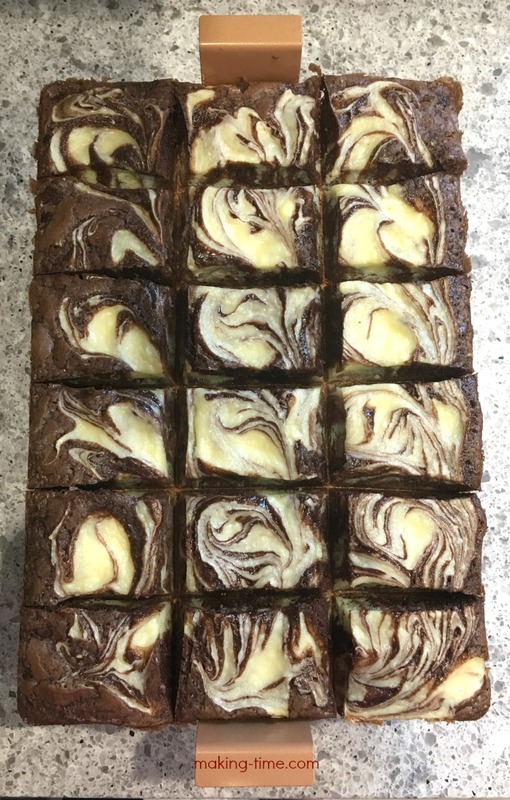 The grid slides right out, leaving you with 18 perfectly sized brownies. I guess I should also mention that even though it’s a nonstick surface, I still took extra precaution and sprayed the pan and grid with nonstick spray. Just look at those brownies! We’ve already finished off the ones I made over the weekend, but I think I need to make some more. 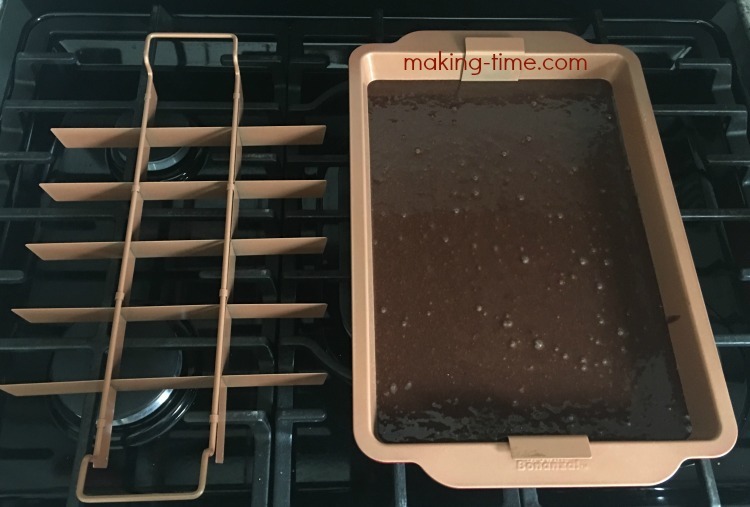 To make serving just as easy, place the cooling rack underneath the pan/tray and the tray of brownies will separate from the pan. Now all that’s left to do is enjoy! It’s Red Copper Brownie Bonanza for the shortcut win! 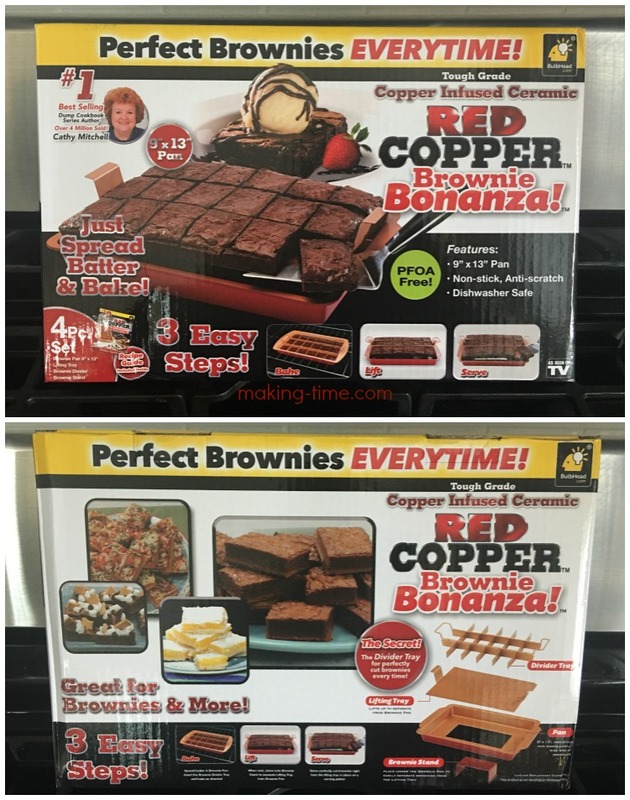 Is the Red Copper Brownie Bonanza a shortcut you’d like to use? You’re just in luck because BulbHead is going to give two lucky Making Time readers their very own Brownie Bonanza! Scroll down for the giveaway form. Want to make brownies this weekend and can’t wait for the giveaway to end? Head over to BulbHead or Amazon, and grab a Red Copper Brownie Bonanza for $19.99! What is your favorite brownie recipe? 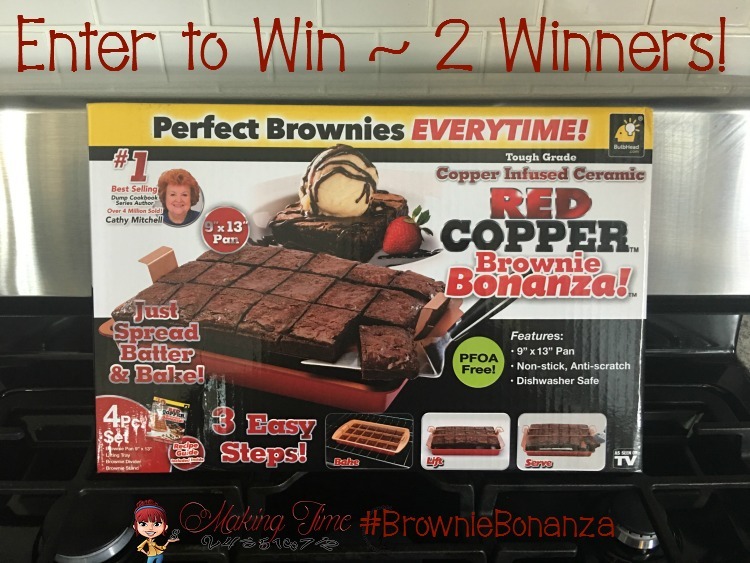 Two lucky Making Time readers will win a Red Copper Brownie Bonanza from BulbHead! GOOD LUCK! This giveaway is open to US Residents, ages 18+ and ends on August 9, 2017 at 11:59 pm est. Random winner will be notified via email and must respond within 24 hours or prize will be forfeited. Sponsor is responsible for prize fulfillment. *Thank you to BulbHead for providing me with a Red Copper Brownie Bonanza for review. This post also includes affiliate links, in which I will receive a small commission for your purchase. My opinions are 100% my own and in no way influenced by the brand. Any claims or statistics should be confirmed with the brand. Please see this blog’s full policies and disclosure here. My favorite brownie recipe is caramel brownies by Taste of Home. They are so good, especially when they are still warm. My favorite is Fudge brownies. I love making Chocolate Chunk Brownies. Nom nom. I always make brownies from scratch, but it’s really because I always have the ingredients on hand. I totally love this pan! 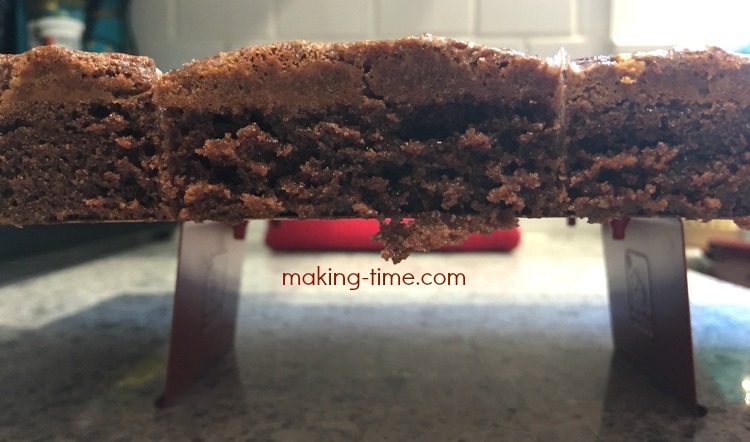 I use foil in my pans to lift my brownies out for easy slicing, so this pan is genius! I like the brownies swirled with chocolate chip cookies! I think it’s by Ghiradelli and can be found in the grocery aisles! These brownies are looking yummy. Can’t wait for it. My favorite is… Butterfinger Brownies. They are delicious! These brownies look amazing! I need the brownie Bonanza you in my life! What a time saver! Perfect brownies every time sounds wonderful! These look amazing! 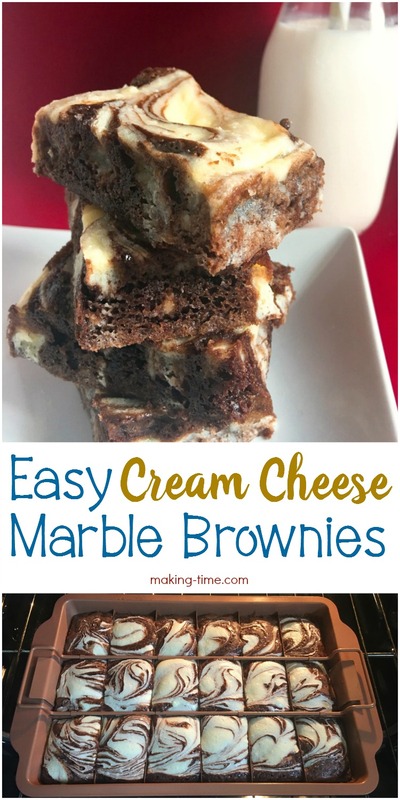 I love a marbled brownie and cream cheese would be so good in them!! The pan looks so nice too! We love all types of brownies at our house, but double fudge brownies have to be our favorite! I like ordinary fudge brownies with walnuts. I love any kind of brownie but these look delicious. 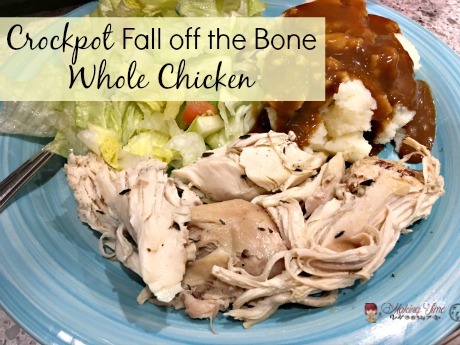 Will definitely have to get me the copper brownie pan and try this recipe. Thanks for sharing. I go for a fudgy brownie loaded with Reese’s Peanut Butter Cups! I love fudge brownies with nuts inside, yum! 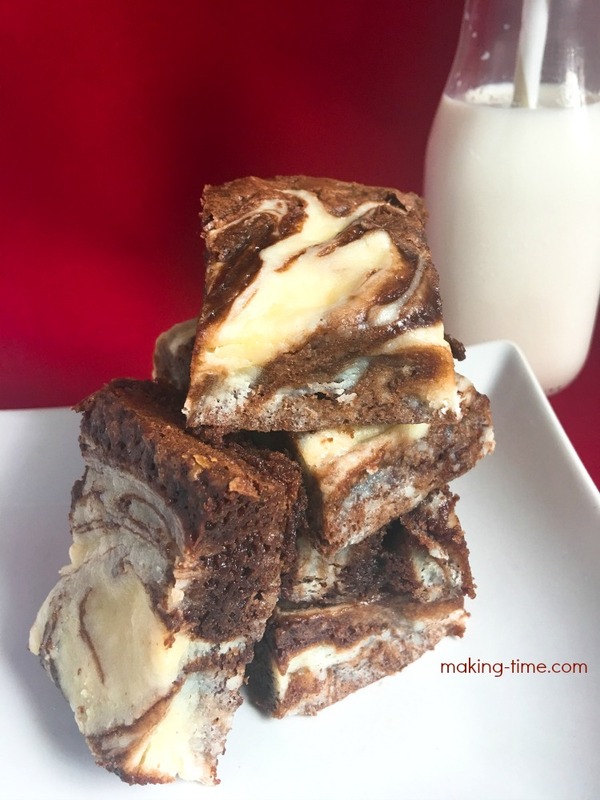 I LOVE Cream Cheese Brownies! Another fave is to add nuts and chocolate chunks. I enjoy peanut butter brownies! My favorite is Peanut Butter Fudge brownies. I don’t have a favorite brownie, but I’d really like to try s’mores brownies. I like to make Cake Brownies with nuts. We all fight for the corners. My favorite brownie recipe has the name of brownies lol. They are from a lady I used to work with and had a whole lot of butter in them! Cutting is always the messiest part of making brownies for events! I love that with this you wind up with uniformly sized pieces! I love brownies with walnuts added in. 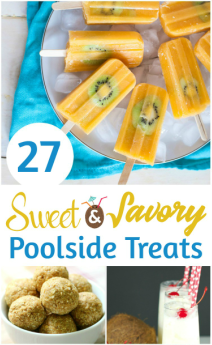 Oh my gosh, those look amazing! Sadly, I’m not much of a cook but I can add an egg and water to brownie mix with the best of ’em! And tat pan could make my box brownies look fabulous! Seriously, though, I’ll be making these brownies. They look wonderful. Thank you! I love Mint Chocolate Grasshopper Brownies–my favorite! My favorite brownies ever are brownies with brown sugar cinnamon on top! Chocolate with chocolate chunks is my favorite type of brownie! I love double fudge brownies! I love walnut chocolate chip brownies. I love Reese’s Peanut Butter brownies!!! I like chocolate walnut brownies. I like fudge brownies with pecans. 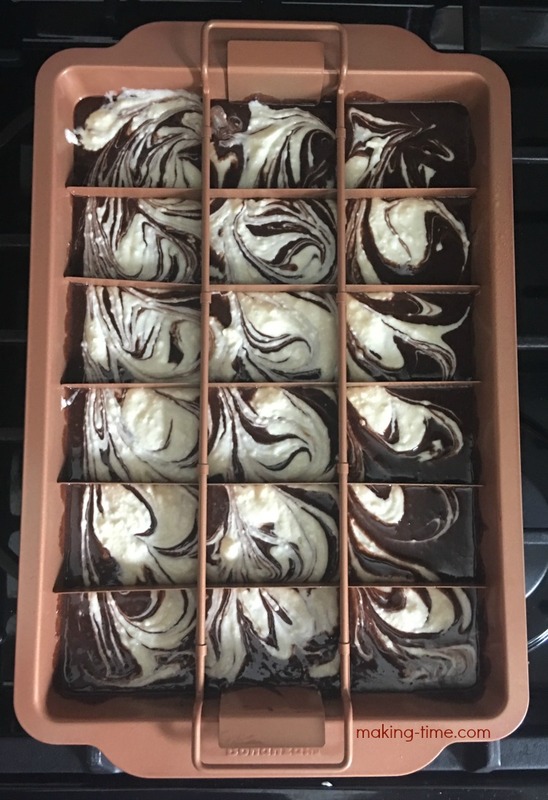 I make Mississippi mud brownies! I like chocolate brownies with frosting. We have a family recipe from many years ago Gina’s Caramel Brownies! I love brownies with walnuts. I just buy the box mix. Fudgy Brownies with peanut butter frosting are my favorite! Fudge Brownies are my favorite. I love my Turtle Brownies recipe! Peanut Butter Chocolate Chip Brownies! Yum! 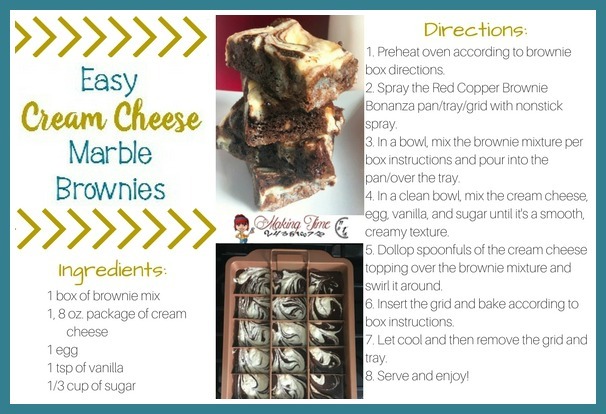 I love a good brownie and cheesecake recipe! It is the marbling that perfectly combines the flavors!